There have been plenty of stellar sequels this fall/holiday season: Halo Reach, Call of Duty Black Ops, Fable 3, and Rock Band 3 immediately come to mind. But one highly-anticipated sequel will be delayed past the holiday season: LittleBIGPlanet 2. Held back to make sure it was the "perfect" experience, Sackboy will return early next year, just in time for the post-New Year's doldrums. So what's a fan of the adorable little mascot to do in the meantime, apart from enjoying the thousands of user-created levels in the original LBP, that is? Perhaps checking out the cool stuff included in the Collector's Edition of the game will tide you over. 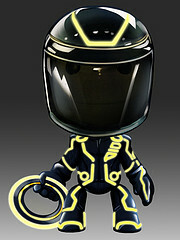 As you'd expect, there are a few new costumes for Sackboy, including a Tron: Legacy suit and the odd but totally awesome inclusion of Gonzo from the Muppets. Rounding out the collection of costumes are a handful of animal suits and a Toy Story 3 "Alien", which I'm guessing is one of the Little Green Men. Five PSN avatars and a nifty steelbook package round out the Collector's Edition features. In the US, you can also expect a 7" plush Sackboy, and a pair of bookends (game-sized, naturally). 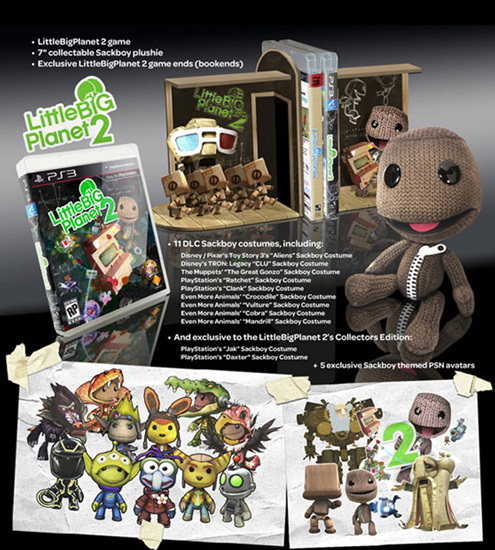 That's some pretty sweet swag for any Sackboy fan! Page created in 0.4304 seconds.